Mount Kilimanjaro is the hike of a lifetime for many seasoned hikers and amateur climbers as while it is one of the Seven Summits, it requires no technical climbing and no real experience. However, rising to an elevation of 19,341 ft. and taking most people an average of 6 days to complete the trek, it is no walk in the park. 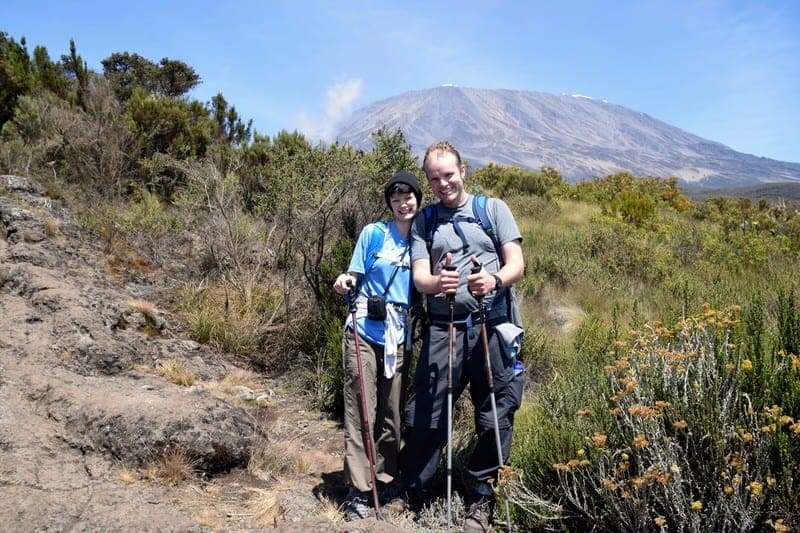 Ethan and I attempted our climb of Mount Kilimanjaro as part of a charity climb to raise money for Vision for the Poor through their biannual Climb for Sight event. There are several routes you can take to climb Mt. Kilimanjaro and we chose the Rongai Route, which is also called the Nalemuru Route, and we chose to do our hike with the Tanzanian-based trekking and safari company Amani Afrika. 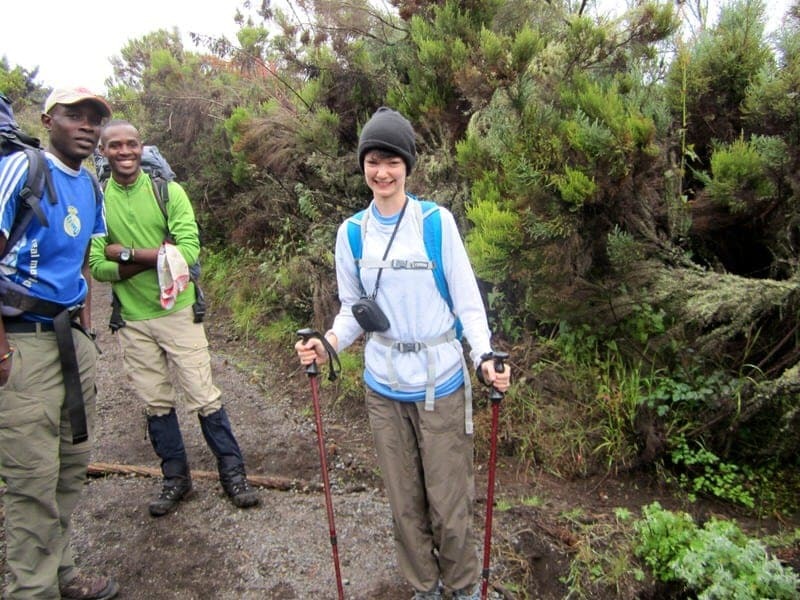 We’ll discuss how to pack for Mount Kilimanjaro, how to choose a trekking company, and how to choose a route in future posts, but in this post we’ll highlight the day-to-day things we experienced on our hike along the Rongai Route and tell you about our crew, the food, and our accommodations on the mountain. We’ll take you through our unforgettable six-day journey on Mount Kilimanjaro with day-by-day descriptions and lots of photos. 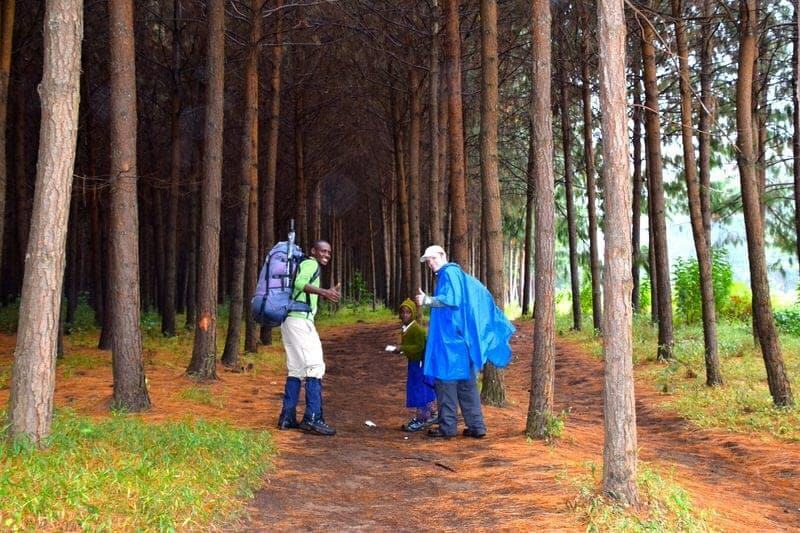 We were told that the very beginning of the Rongai Route may change slightly as it currently passes through several farming areas in the cultivated forest and it will begin at a different spot; however, these changes will be minor and will only affect the very beginning of the hike. 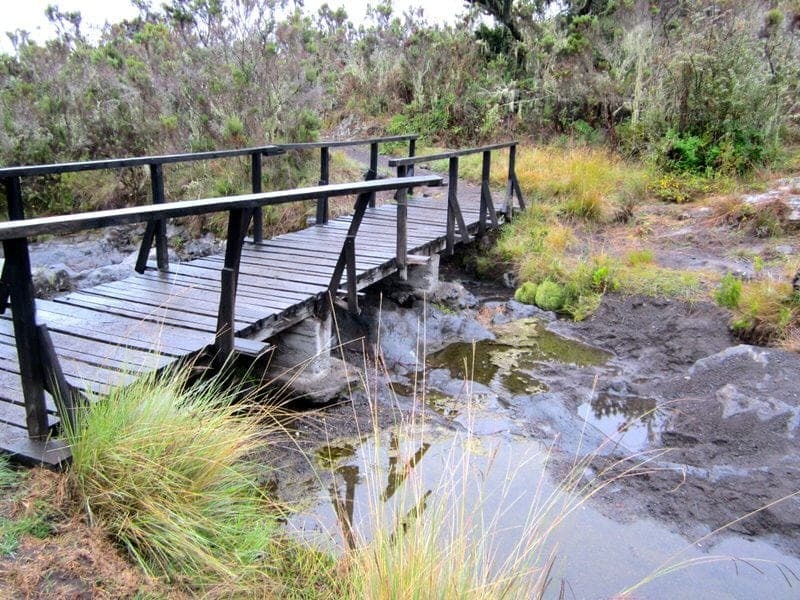 It should also be noted that the Rongai route is not a set route and depending on the chosen trekking companies itinerary, the specific campsites and route may differ somewhat from the route we took (e.g., some may sleep at Kikelelwa Campsite on the second night instead of the Second Cave campsite); however, the beginning of the route and the use of Marangu Route to descend should be the same. 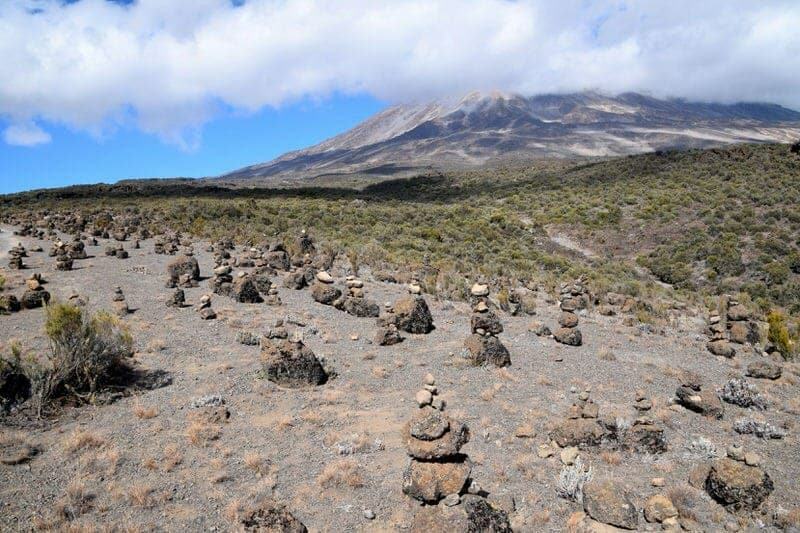 We did the Rongai route in 6 days/5 nights but some companies or hikers may prefer to do it in 7 days/6night to include an extra day for acclimatization which may increase chances of summiting. We’ve also seen the route offered for 5 days/4 nights by a couple of budget companies which we’d strongly advise against as although the first few days of hiking are short and relatively easy, the altitude gain is quite a bit and your chances of altitude sickness and not being able to summit are much greater if you try to do this in less than 6 days/5 nights. We had a long drive from our hotel The African Tulip in Arusha to the beginning of the Rongai Route, which took about 4 hours. We had to first stop at the Marangu gate to get our permits and then we had to drive almost 2 more hours to reach the beginning of the Rongai Route which is close to the Kenya-Tanzania border. Originally we had planned to begin our Mount Kilimanjaro climb a day earlier after passing through the Kenya-Tanzania border at Loitokitok which is near the beginning of the Rongai route, but Jessica had started running a fever a day before the initial climb date and having reactions to the yellow fever vaccination so we delayed the climb a day to give her time to recover and traveled from Arusha instead. Along the way to the gate we also stopped at a local market in Mwika so that our cook Jamal could pick up some fresh meat and vegetables for the climb. Jessica also bought a pair of flip-flops for $2 since she hadn’t packed any sandals for the trip. Once we were at the Rongai gate, we parked and our guide Salim had us sign in and gave us lunch boxes to eat under a covered picnic area. A few other climbing groups were also here eating lunch. This was our first introduction to the lunch boxes in Tanzania and we learned that they are typically quite generous and good. Meanwhile, our team was being assembled, checked in, and all the gear was being weighed, checked, and divided. This full process took about an hour and then we briefly met each of the 11 porters and our assistant guide Anwary as we’d already met our cook Jamal and our head guide Salim who traveled with us from Arusha. We were surprised by the number of people on the team, but it takes a lot of people to carry all the food and supplies and each porter can only safely carry so much as we had some extras that are not often included on climbs such as an emergency oxygen tank and a portable toilet which add extra weight. Finally, we set off on the beginning of the Rongai Route (a.k.a. Nalemuru Route) with Anwary, our assistant guide, and then Salim caught up with us a bit later on the hike as he stayed behind to assist the porters. The porters left the gate after us but each passed us along the route as they all walk at a steady clip and we are asked to walk slowly (pole pole) on the route. Unfortunately, it had started raining off and on that morning and so the first part of the hike was in light rain, making it necessary for us to put on our ponchos to cover ourselves and our packs which were not waterproof. Luckily, the rain stopped about an hour or so into the hike. Along the route we also met a little girl named Asha whose family lives and works in the forest. She was shy and spoke to us very little but it was clear we interested her as when we’d stop to look at something or take a break, she would stop as well and kept pace near us until she reached home. 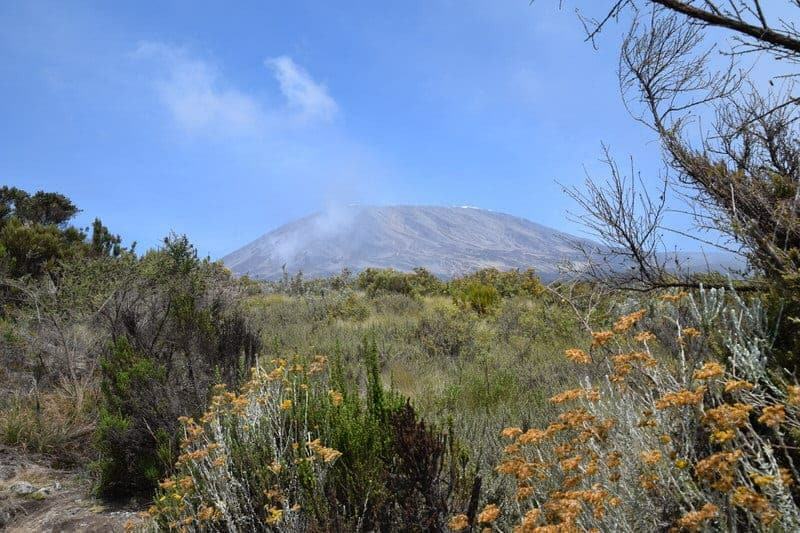 The first day of hiking was through cultivated forest, natural forest and into the lower part of the moorland, and it was an easy 3 hours of hiking on a fairly flat well-marked trail. There was even a stand along the trail selling some food and drinks, a non-flushing toilet, and a picnic area on that first day. The early part of the trail along the forest and farming areas was cool and covered and we even got to see the black-and-white colobus monkeys in the trees. Both black-and-white colobus monkeys and blue monkeys can be seen in this part of the forest and our guides told us that it is believed to be good luck to see a colobus monkey at the beginning of the hike. 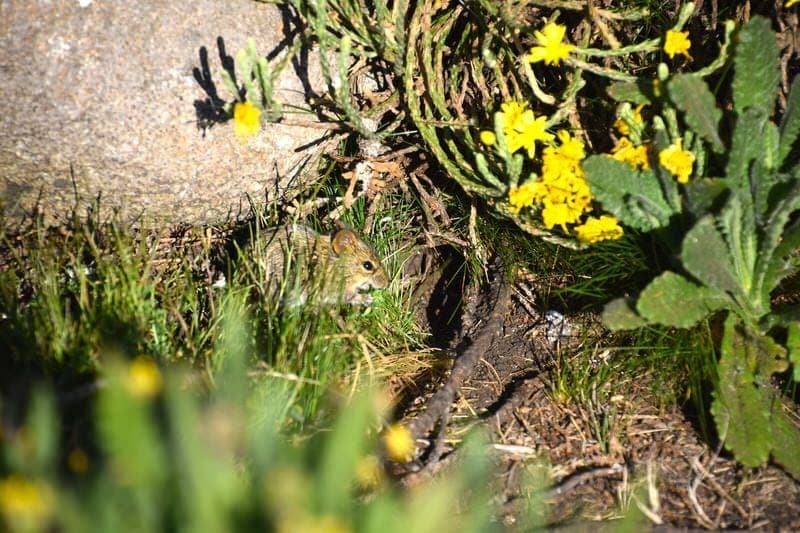 During the hike, we also saw and learned about many plant, insect, and rodent species along the way as our guides were very knowledgeable about the native plants and animals and often stopped to point out things such as medicinal plants, birds, and ants’ nests along the way. We even spotted a buffalo in the distance as we neared our campsite for the evening through the trees; however, while I wanted to stop and take photos our guides hurried us along as a lone male buffalo can be quite dangerous if provoked. Buffalo sightings are not that typical on the trail but both buffalo and elephant sightings do happen along the route sometimes. The hike that first day seemed to go by quickly as we spent most of it talking with Salim and Anwary and getting to know each other. We were not even tired on that first day when we reached our first campsite called Simba Camp, which apparently is named such because someone once saw a lion at this spot. At camp, we were both surprised by the number of tents that were for our group as there was a mess tent, a cooking/kitchen tent, our tent, four tents for the crew, and even a little tent for our toilet. Our own little mini tent village! The entire crew was there and they sang for us and then it was time for us to wash up and have lunch. Hiking Highlights: The flora and fauna of the forest area, walking with Asha, getting to know our guides and crew, and spotting the Colobus monkeys and buffalo! Hiking Lowlights: The rain at the beginning of the hike. Today we got up around 6:30, had breakfast at 7:00am, and started hiking around 7:30. As we hiked from Simba Camp to Second Cave, the trail remained well delineated and the landscape became drier as we walked further into the highlands area. The trail became a bit steeper and more rocky in places, but the hike was still quite easy for us. The clouds had lifted from the previous afternoon and we got our first view of the snow-capped peak today! We kept at a slow but steady pace with only two short breaks during the day and while many hikers passed us early into the hike, we ended up being one of the first groups to make it to the campsite that evening because we didn’t take any long breaks. Our guides cautioned us from walking quickly as some of the other hikers were doing as they would tire out and this seemed to be good advise and quite true. One of our breaks that day was at the so-called First Cave, which is just a small cave, and then it was another 30 minutes pass this landmark to reach the Second Cave campsite. We arrived at the campsite around lunch time. It was after lunch that Jessica developed her first headache; however this would go away with ibuprofen by evening. The headache felt different from a normal headache and felt like pressure pushing against the top of her head. Jessica would first recognize it when she thought her hat was too tight and then she went to take it off and realized she wasn’t wearing a hat anymore. Later around 4:00pm, we set out with Salim and Anwary to do a short hike to a higher altitude. We hiked for about 25 minutes and then rested at the higher altitude for about 15 minutes and then hiked back down to the camp. These acclimatization hikes allow you to “climb high, sleep low” and help your body become better adjusted to the higher altitudes. Hiking Highlights: Checking out the caves, first view of snow-capped peak, and enjoyable morning hike. Hiking Lowlights: Light headache (Jessica). Today we again got up around 6:30am, had breakfast at 7:00am, and started hiking around 7:30am. 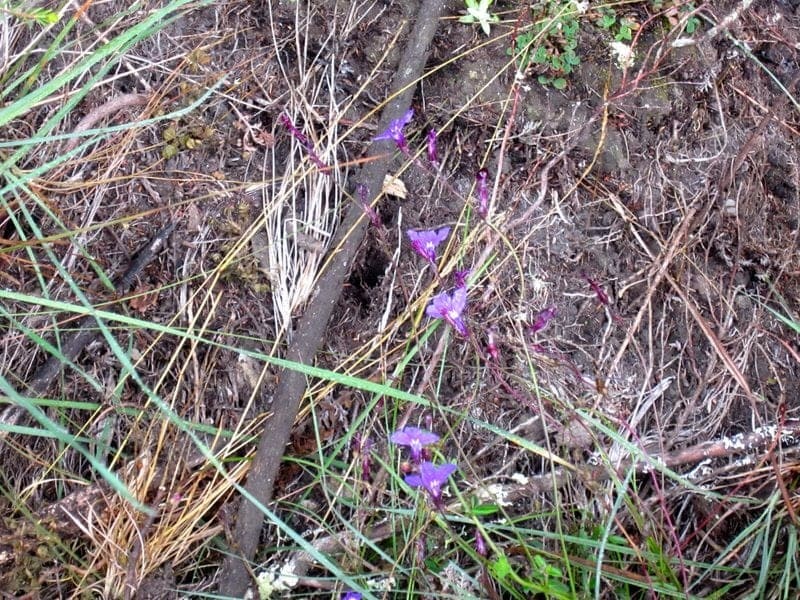 The trail became less well-marked today and in places we were not really sure how our guides knew where to go but clearly they are experienced and know how to follow the trail even though we were no longer on a clear path at times. The landscape continued to become more barren and rocky, but the hike was still quite easy and we arrived at the Third Cave around lunchtime. When we arrived at the campsite, we were the only group there so we had the campsite to ourselves which was nice. We later discovered during the afternoon acclimatization hike that a lone German hiker and his small crew were camped on the other side of the camp that was separated by rocks. 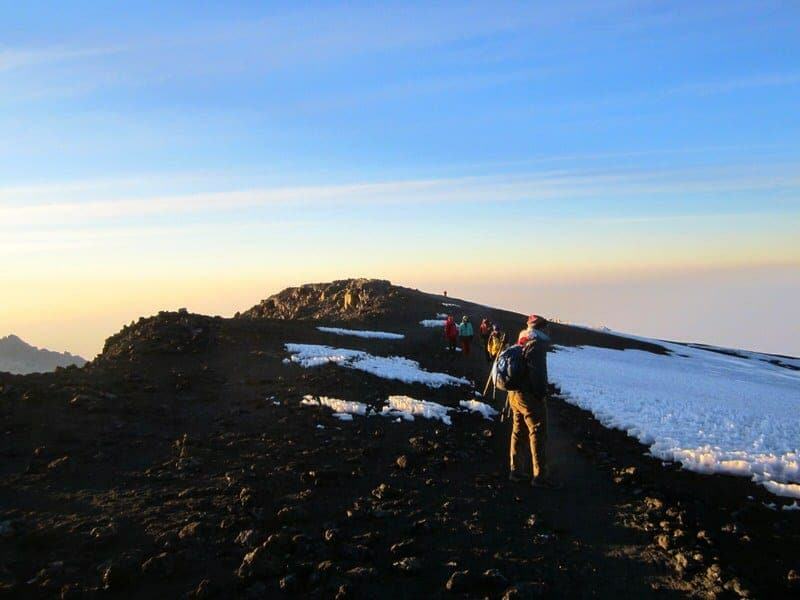 One of the reasons that hikers choose the Rongai route, which is one of the least travelled, is the lack of crowds whereas other more popular routes such as Marangu and Machame can be quite crowded. Jessica experienced another headache around bedtime which again responded reasonably well to medication (ibuprofen and Excedrin). Hiking Highlights: Enjoyable morning hike and having the campsite to ourselves. This morning we again got up around 6:30am, had breakfast at 7:00am, and started hiking around 7:30am. 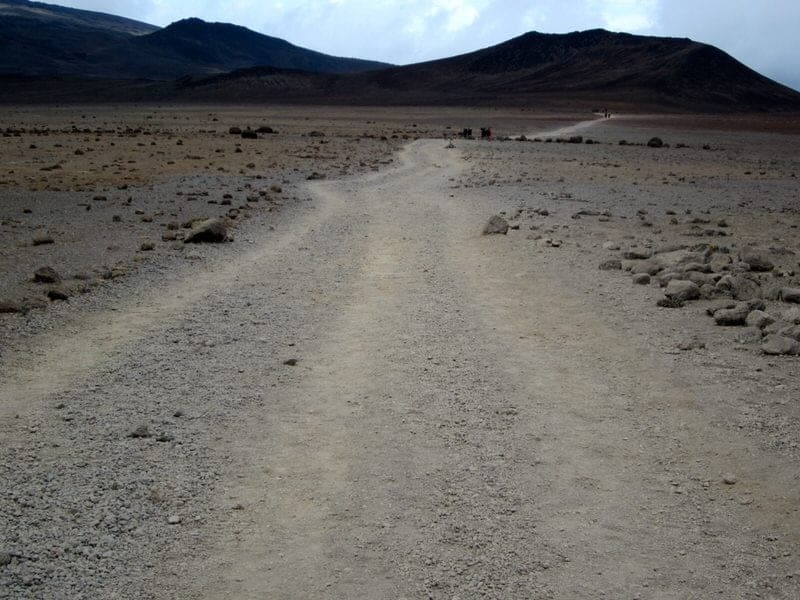 The path becomes even less well-marked today and the landscape begins to resembles something from the moon or another planet as it is rocky, barren, and dry. We imagined during our hike that we were the last four people on earth as we walked across this barren landscape between the volcanic cones of Kibo and Mawenzi. During the wet season, there are some streams here but these were almost completely dried up by this time of the year. About an hour from camp, we stopped at this large rock formation and among the rocks was a dead buffalo. Salim told us that he thinks the buffalo carcass has been here for about 3 years and the buffalo is believed to have gotten caught in the rocks. It is surprisingly well-preserved because of the environment with much of its skin still intact and it was an interesting chance to see a buffalo up close. However, if you get too close as we did, you can still smell the rotten animal smell which is a bit gross but also morbidly fascinating that it has survived all this time. Interesting parallel between having just read about Hemingway’s leopard and our own buffalo. The rock formation also served as a good natural bathroom stop before we headed onto School Hut. It was soon after leaving here that Jessica began to get a headache again and also began feeling nauseous. The headache became stronger during the last hour of the hike and Jess went straight to the tent to lie down once reaching camp. She had only tea for lunch and then ate only soup for dinner, spending the majority of the evening lying in the tent. Her headache stopped responding to medications and she continued to feel nauseous. There was no acclimatization hike this afternoon since tomorrow is summit day. 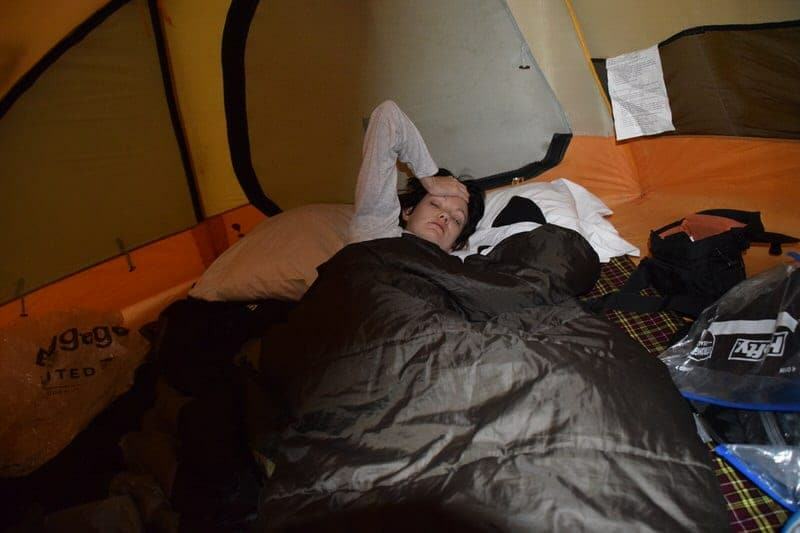 Ethan ate an early dinner and came to bed around 7:00pm to sleep to get some rest before the summit climb. It was quite cold at camp so we slept in our thermals, coats, and hats. We discussed before we went to bed what we would do if the headache and nausea didn’t improve and we had already decided before beginning the climb that if one of us got sick, the other would keep going. We went to bed a bit disappointed as we both really wanted to summit together but it seemed like this might not happen and also anxious as we weren’t sure what to expect on the actual summit hike. At this point, no one really expected Jessica to attempt the summit. Miraculously we both fell asleep and got about 4 hours of fitful sleep. 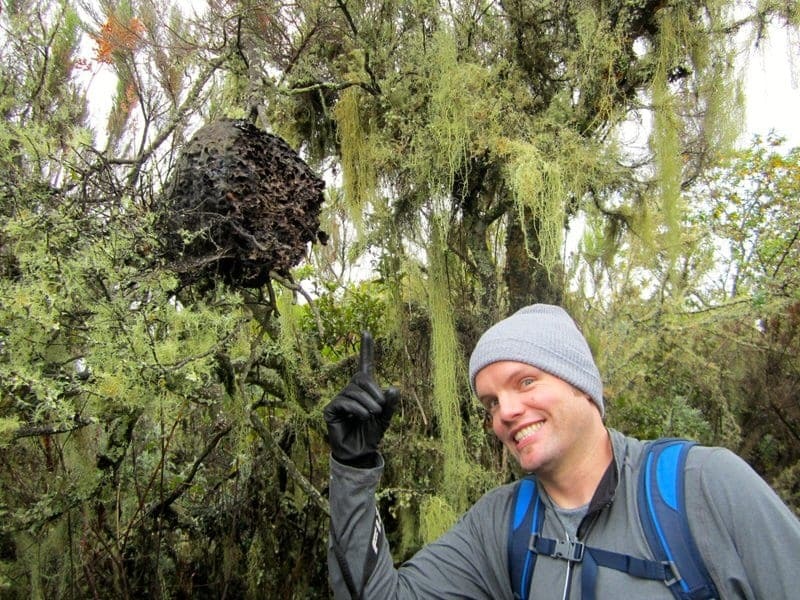 Hiking Highlights: Moon-like landscape, buffalo carcass, and anticipation about summit day. 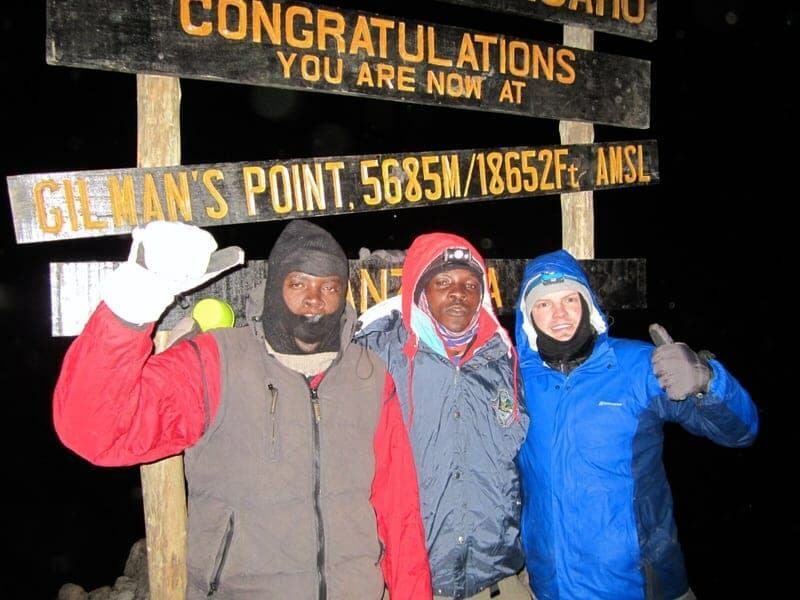 At 11:00pm (23:00), we were awakened to get dressed and ready for the summit climb. Jessica was feeling a bit better and decided to try to summit. She knew she would regret it if she didn’t at least give it a try. We had tea and coffee and some biscuits and then set out into the dark night with Salim, Anwary, and one of our porters Zephania who was carrying our oxygen tank. It was pitch black so we used the light from our head lamps to guide us and we learned that you must look down most of the time to keep from slipping on the rocky surface. The climb almost immediately became much steeper and more rocky than we’d encountered on any of the prior days as we slowly moved upward along the rocky trail towards the crater rim. Jessica’s gloves ended up not being warm enough and her fingers began hurting and feeling numb, so she ended up stowing her hiking poles and keeping her hands in her coat pocket. About two hours into the hike, Jessica started feeling worse and began feeling dizzy and her headache and nausea from the prior day returned. Soon after, she made the decision that she wanted to stop at the next junction and go down. It was about an hour until the junction to descend to Kibo Hut and while the guides encouraged her to keep going and supported her so she didn’t slip or fall, she made the decision to go down as she was no longer enjoying the experience and was feeling quite sick. We said goodbye to each other and although we were sad that our chances of summiting together were over, we were both hopeful that Ethan would still be able to make it to the top. 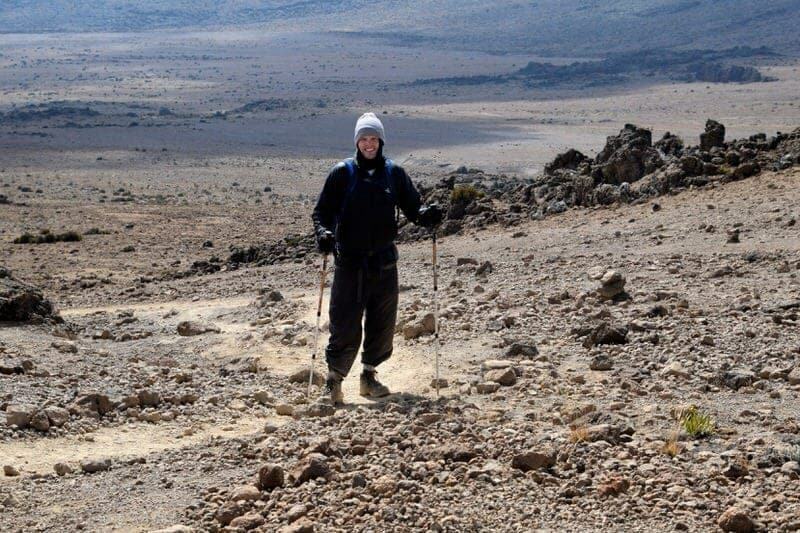 Jessica made it to the junction between School Hut and the trail to the summit from Kibo Hut which is at 5,174 m (16,975 ft). She then descended with guide Anwary to Kibo Hut which took about an hour and she was given a bunk in a shared hut and a borrowed sleeping bag so she could rest. Ethan, Salim, and Zephania pushed forward towards Gilman’s Point. They made slow but steady progress, even passing some other climbers along the way and met some climbers who had decided to turn back. In order to have a check to see how clearly he was thinking and to keep motivated, Ethan began saying to himself “Jessica, one, two, three, four” which he would repeat every 10-15 minutes until the summit. The trio reached Gilman’s Point (5,685m) around 5:30am and here Ethan felt relief and felt fairly certain that he would be able to summit. After a short break, the three pressed forward and soon the sun began to rise and they were able to turn off their headlamps as they approached the summit. At this point, there were few climbers and they continued up the rocky path and although very cold, they were lucky that it was not too windy. Around Stella’s Point, Ethan began seeing the glaciers in the early morning light and at this point they met a large group of hikers and people began filing slow towards the top. It is not as steep at this point but given the altitude each step begins to feel like a tremendous effort as you slowly shuffle forward. The surface here resembled what Ethan imagines a frozen moon or Mars landscape and the glaciers were very awe-inspiring as these were his first up-close glimpse of such large patches of ice. Around 6:40am, Ethan finally saw the wooden sign at the summit of Uhuru Peak! 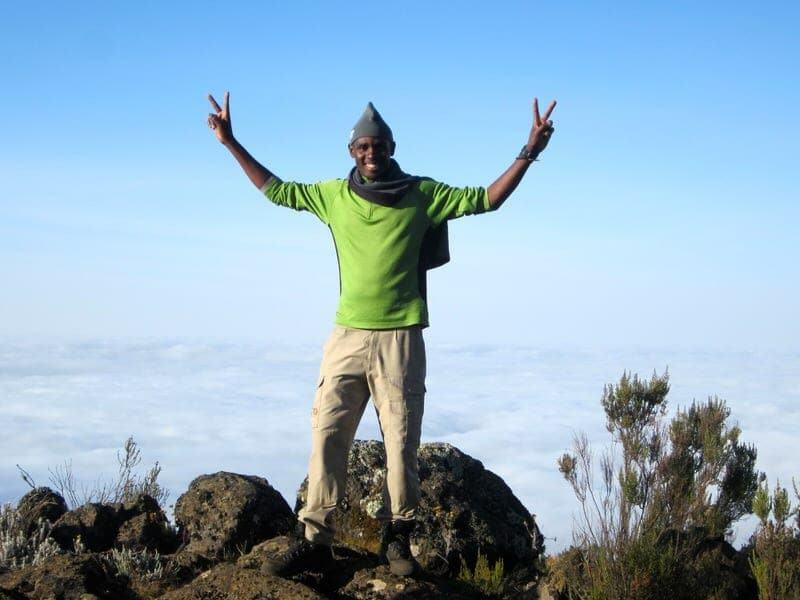 He had made it to the highest point in Africa! This was a special accomplishment for him for two reasons: 1) he had done it partly for the Climb for Sight charity and 2) because it made him feel that he could do more than he ever thought he would be able to do with his congenital heart condition (his most recent open heart surgery being in November). 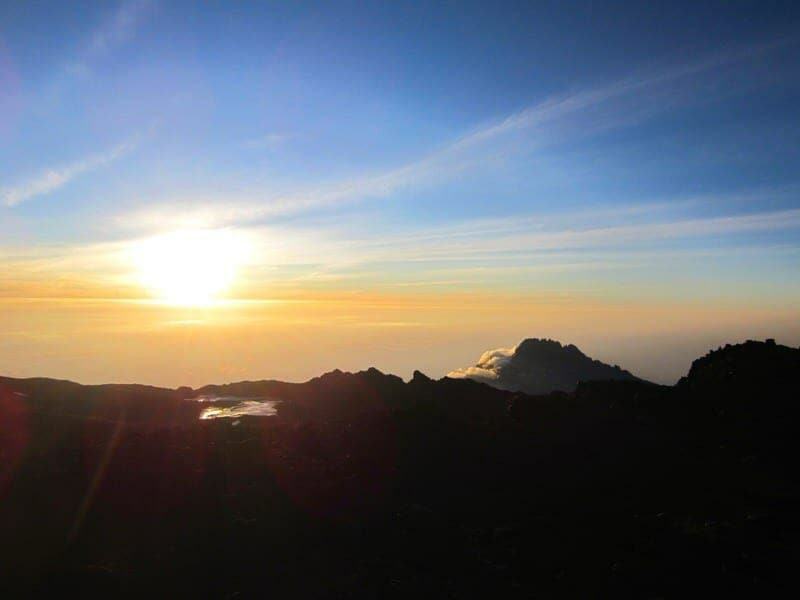 He walked around and took photos from the top, including the glaciers, sunrise, and views over the Kibo Crater, and then waited his turn to be able to take photos with the summit sign. After several photos, brief victory celebration, and a brief 15 minute break, they had to head back down as it is not wise to stay on the top for long given the freezing cold weather and high altitude. As he left the summit and headed down, Ethan felt such a sense of achievement and relief as around him climbers are congratulating those who are going down and encouraging those who are still making their way to the top. The way down was much faster than the way up and given that it was now light out, he was able to take in more of the beauty of the mountain. 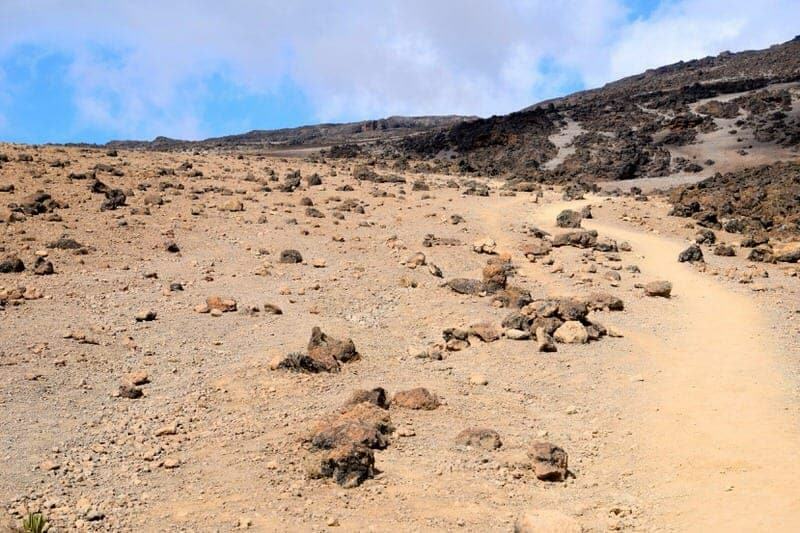 The three made their way down relatively quickly, although going down can be a bit more dangerous than going up as it is easy for climbers to slip and fall on the volcanic scree and rocks. 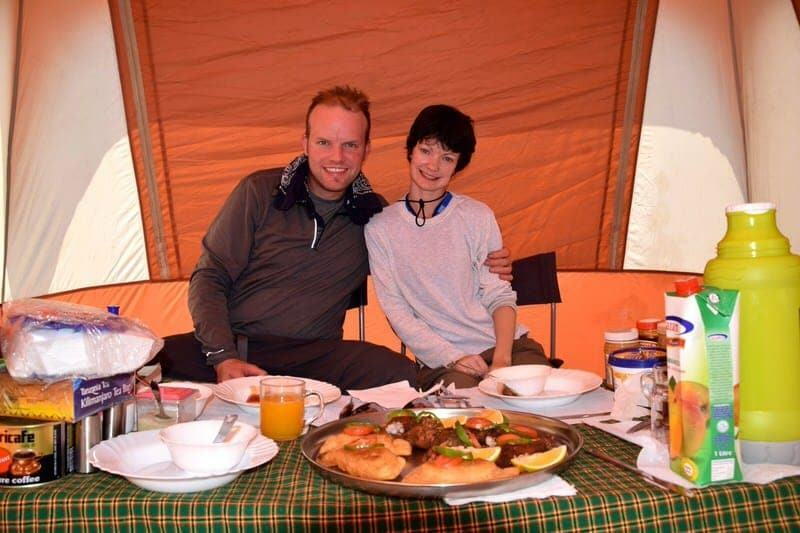 They made good time and Ethan made it back down to Kibo Hut around 9:30am. 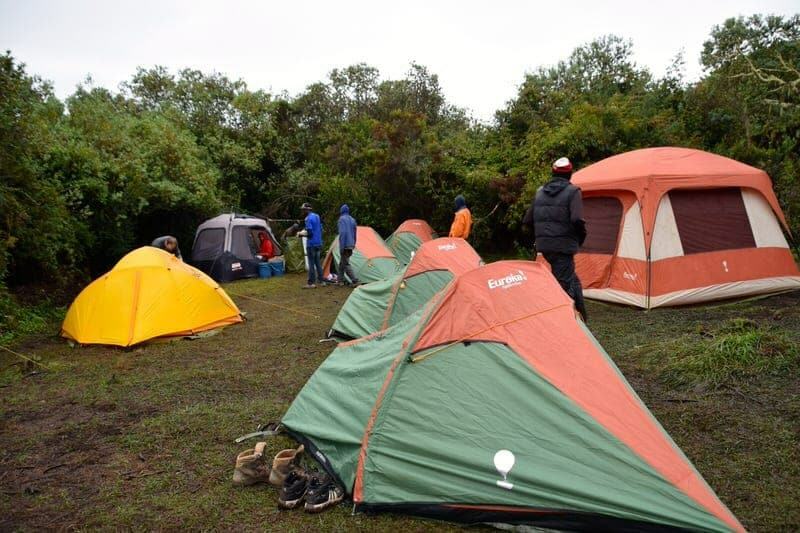 Soon after Ethan returned, our team had arrived at Kibo Hut from School Hut and had set up all our tents. Ethan drank some juice and then slept for about 1.5 hours while Jessica read and then we had to get back up for a quick lunch before heading down the mountain. 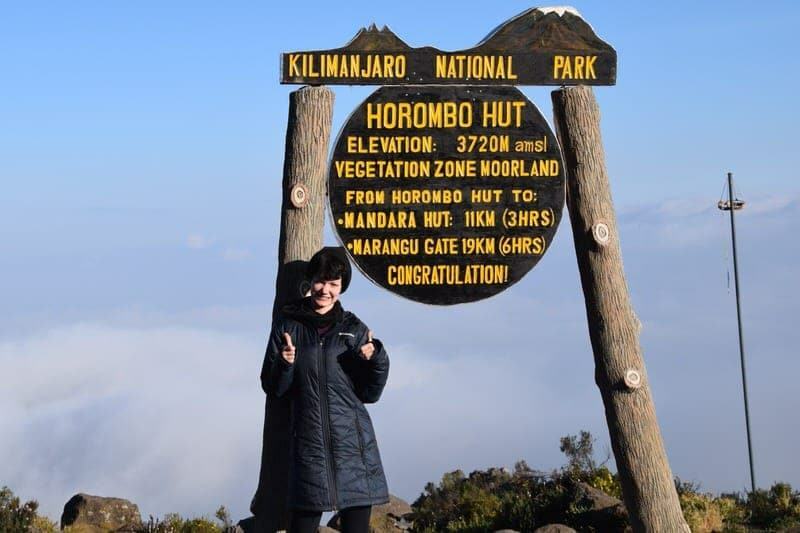 As someone who just summited, the last thing you want to do is hike anymore after reaching Kibo Hut, but unfortunately it is not good to stay at this high of an altitude and it is recommended that you sleep at a lower altitude. We were prepared for this ahead of time and knew we’d had to go back down, but we heard other climbers who were quite unhappy about having to wake back up and spend another few hours hiking as it does make for a very long day. 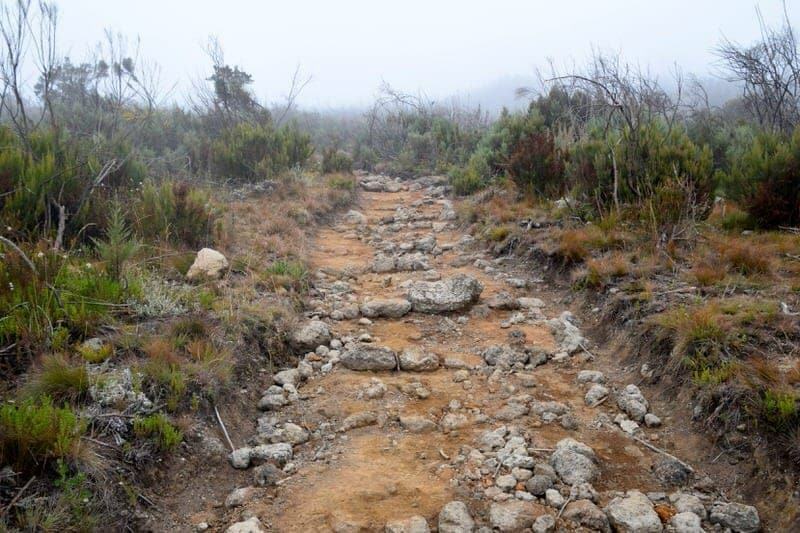 So off we went for about 3.5 hours to reach Horombo Hut. It is a fairly barren landscape and not much to look at, but the trail was easy and well-marked as trucks can be driven up this section of the Marangu Route. We arrived in time for some afternoon tea and a snack and then had some leisure time before dinner. After dinner, we formally said goodbye to our crew since it was our last evening and distributed thank-you’s and tips. A bit bittersweet as we had somehow become used to the steady patterns and rituals of camping life, but we were also very excited to be returning to comfortable beds and hot showers. Hiking Highlights: Ethan successfully making it to the top of the mountain!!! Jessica was also happy to have at least attempted the summit and gotten to almost 17,000ft. Hiking Lowlights: The very long exhausting amount of hiking and Jessica feeling sick and not summiting. This morning we asked to start a bit earlier as we had a long day of hiking and wanted to get to our hotel in Arusha by around 4:00pm. So we got up around 6:00am, had breakfast at 6:30am, and started hiking by 7:00am. Today was a very long day of hiking and the landscape went from being fairly barren to a lush rainforest. The trail scenery is quite pretty in many places as you cross several streams, the plants become more diverse, and you are able to hear the singsong of birds in the trees. The lower sections of the Marangu route are much wetter and more lush than those of the Rongai route so it was nice to have new scenery during the descent. Unfortunately, it decided to lightly rain that day so the trail was wet during the latter part of our hike, making it more difficult to descend quickly as parts of the trail were quite muddy and slippery. You go down much more quickly than you go up but it is much harder on your knees and our knees would be sore for the next few days following the hike. 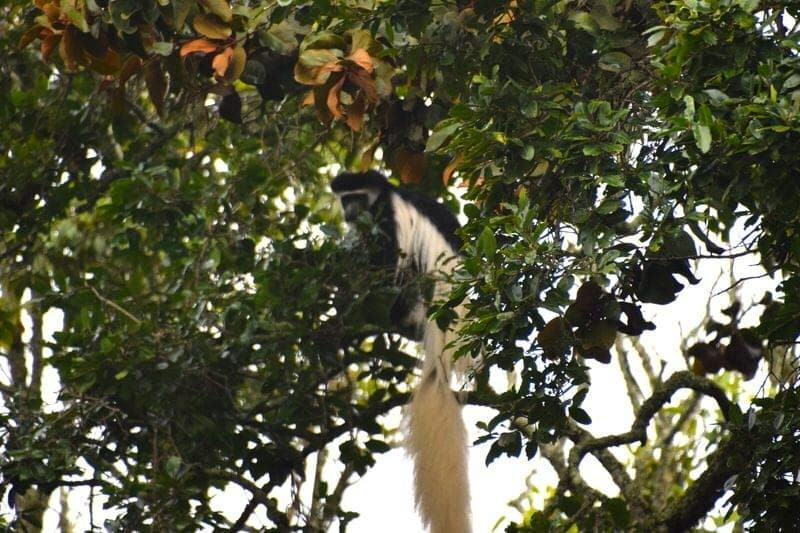 Salim told us that if you see a black-and-white colobus monkey as you are leaving the park, that this means you will someday return to Kilimanjaro. We didn’t see any monkeys as they were probably hiding from the rain, but I think we may have chosen to close our eyes as we think climbing Mt. Kilimanjaro is likely a once in a lifetime experience for us. We decided not to break for lunch and only took a few very short breaks on the descent until we reached the Marangu gate! We were finally there after what seemed an endless day of hiking! After you are done, each climber enters their information and how far they made it on the climb. For those who don’t at least reach Gilman’s Point they get lines drawn through most of their entry. 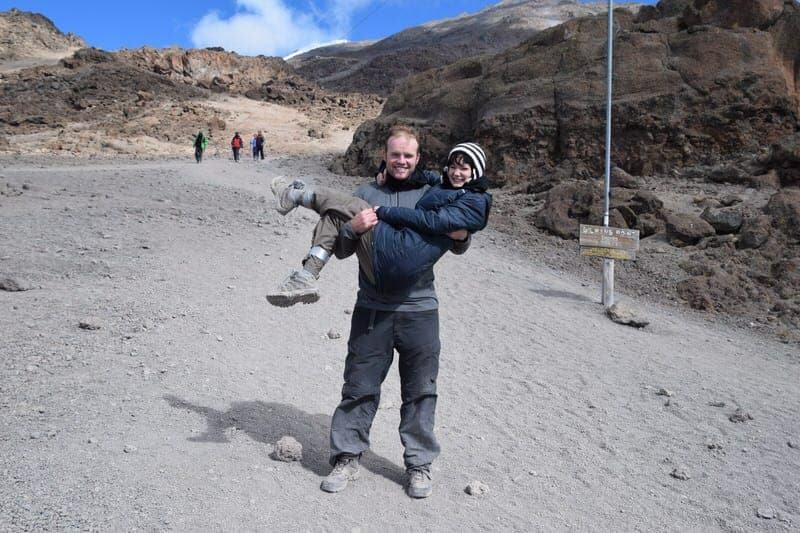 Jessica sadly watched her entry get a big line through most of it, but Ethan got to add the time that he reached Uhuru Peak and received an official certificate. 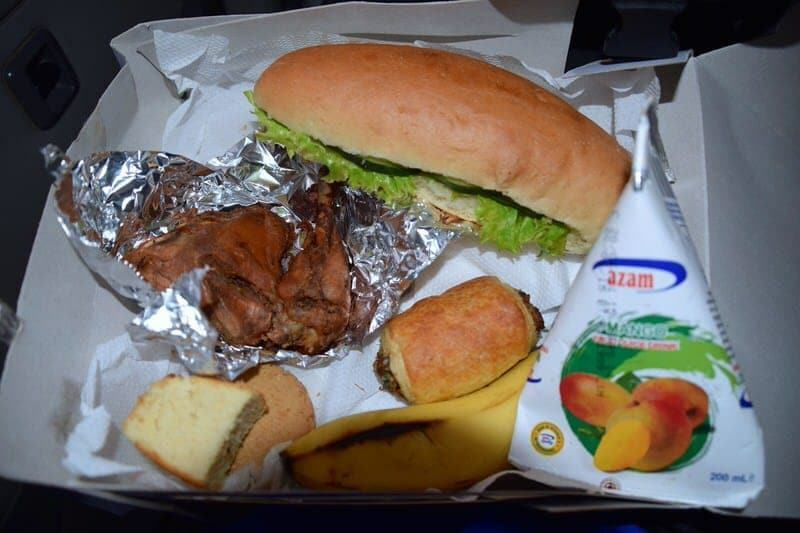 We then had lunch in the awaiting Amani Afrkia van while everything was organized for our departure. 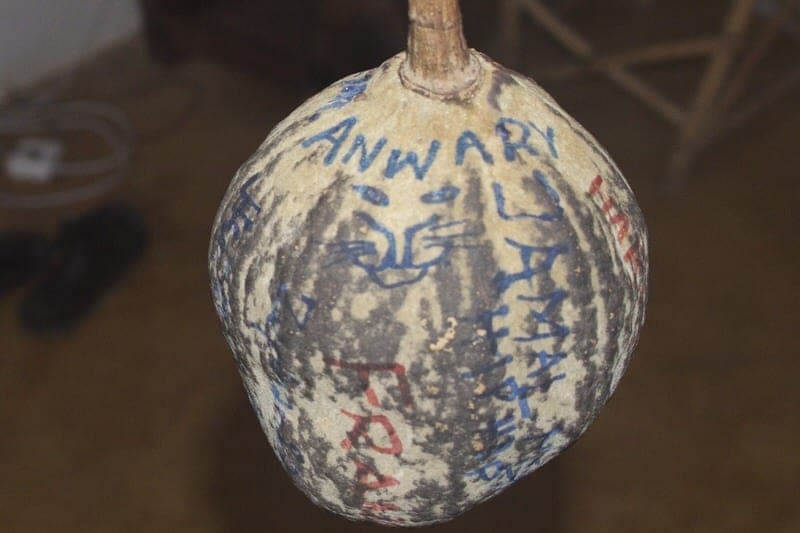 We got to again say goodbye to our crew as all our porters were here and we had them each sign the outside of a baobab fruit as a souvenir of our climb. The baobab fruit was a perfect souvenir and was our guide Salim’s idea as we had asked him about the fruit after seeing it in the market in Mwika before we started the climb. He had bought one of them for us to eat so we could try it, but then decided that it might make for a better souvenir and he tied it to his pack and the baobab fruit accompanied us on the entire climb. We plan to cover it with some protective clear gloss and remove the inside seeds when we return home to help better preserve it. 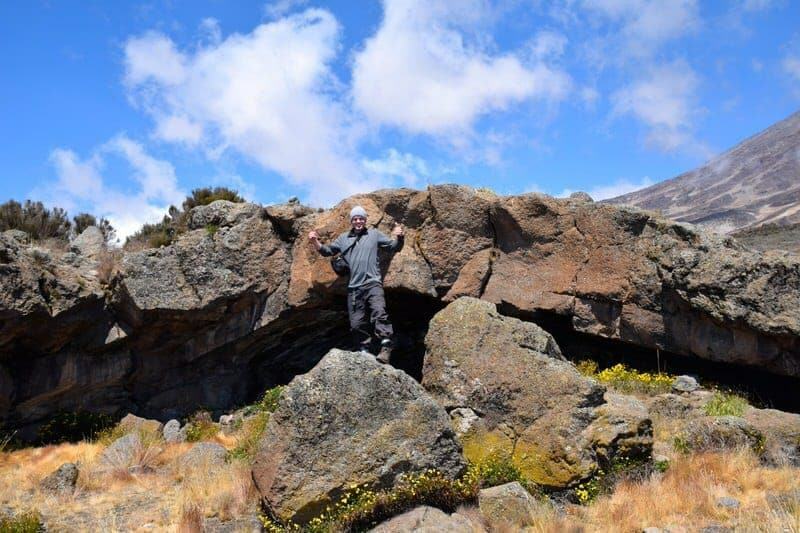 It is a great unique and memorable souvenir of our Mount Kilimanjaro climb. We would then make our way back to Arusha and arrive at our hotel, Machweo, for the evening around 4:00pm. Excited for the big clean bed, warm shower, and gourmet dinner ahead of us, but also a bit disappointed to be done with this part of our trip and sad to leave behind all the people who had become an integral part of our lives for the past 6 days. 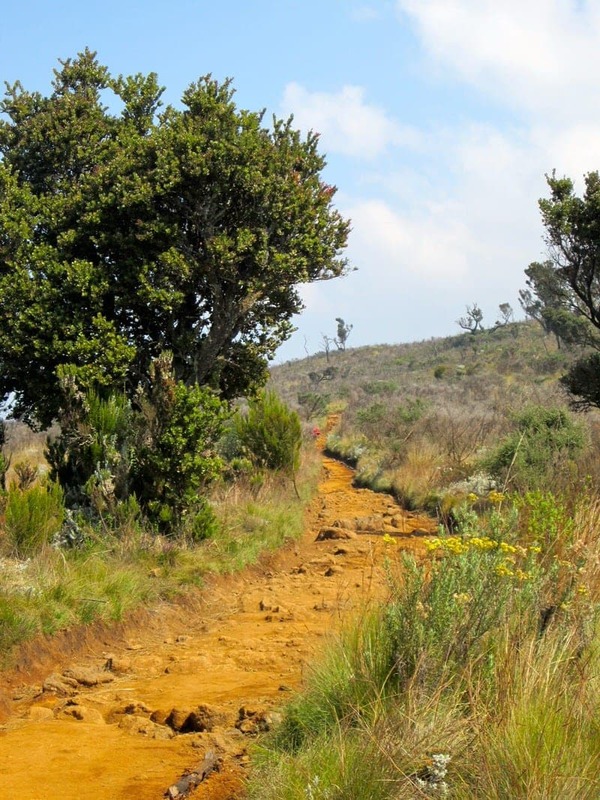 Campsite: None, exited trail at Marangu Gate and return to Arusha. Hiking Highlights: Rainforest scenery, Jess finally being headache-free, and completion of the trail! Hiking Lowlights: Light rain which made trail slippery in places, the long descent, and saying goodbye to our crew. The finish line! We’ve made it! Our prized baobab fruit souvenir! 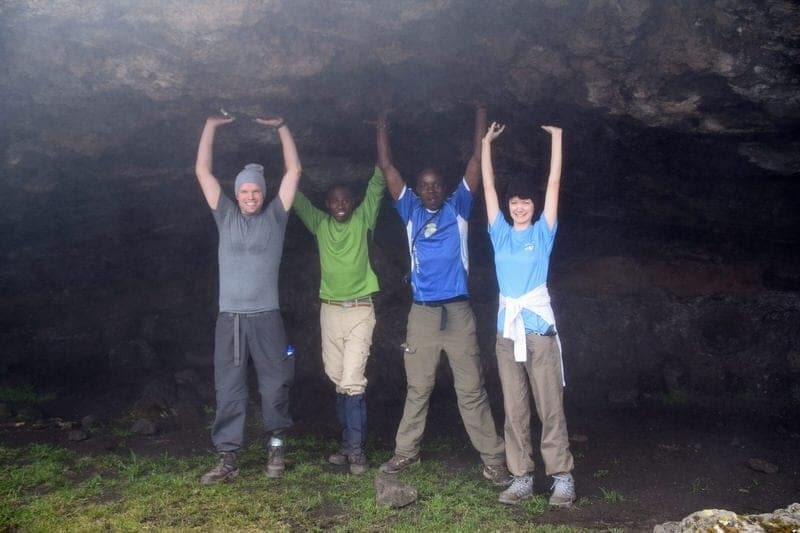 We had a fabulous climbing team that was put together through Amani Afrika. It was a big crew consisting of a head guide, an assistant guide, one cook, and 11 porters. Godwin Temba, the owner of Amani Afrika, actually drove us from our hotel in Arusha to the gate and helped make sure everything was in order for our climb. 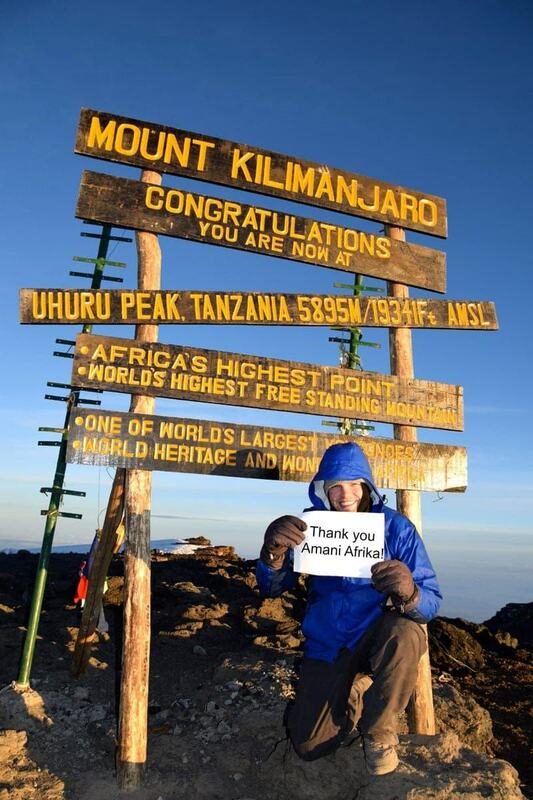 This more personal touch helps differentiate Amnai Afrika from many other trekking companies. Our head guide Salim was a very experienced guide, having risen from being a porter to becoming a head guide. He was patient and understanding and was very much invested in making sure we were comfortable as possible and had the best chance to make it to the summit. Salim was responsible not only for us, but was in charge of the whole crew and each morning he would stay behind to make sure everything was in order before joining us on the trail. Anwary was our good-natured and knowledgeable assistant guide. He accompanied us on all the hikes and often ate meals with us and was second in charge of the crew after Salim. Anwary was always smiling and knows the names of a seemingly endless number of plants and animals in Swahili, English, and Latin. Both guides spoke good English and were happy to teach us some words and phrases in Swahili. Ethan’s favorite phrase he learned was poa kichizi kama ndizi which translates to “crazy cool (or good) like a banana”. Jamal, our cook, was a jovial guy and in addition to being a great cook, he is also a lover of hiphop and would sometimes entertain us with spontaneous hiphop songs. Ethan, Salim, and Jamal would spend quite a bit of time discussing various hiphop and rap singers as American hiphop music is apparently very popular in many parts of Tanzania and we learned about some of the local Tanzanian and Kenya hiphop artists as well. Our crew consisted of eleven porters: Francis, Yusuph, Abdala, Haruna, Habibu, John, Ramadhani, Dastan, Zephania, Huseini, and Yunusi. The porters were like soldiers as they quickly broke down our camp each day, carried everything along the trail (arriving hours before us), and then set up our little camp village each day. After we arrived at camp most afternoons, our crew would greet us and sing a few songs to celebrate the completion of the day’s hike and getting one day closer to the summit. 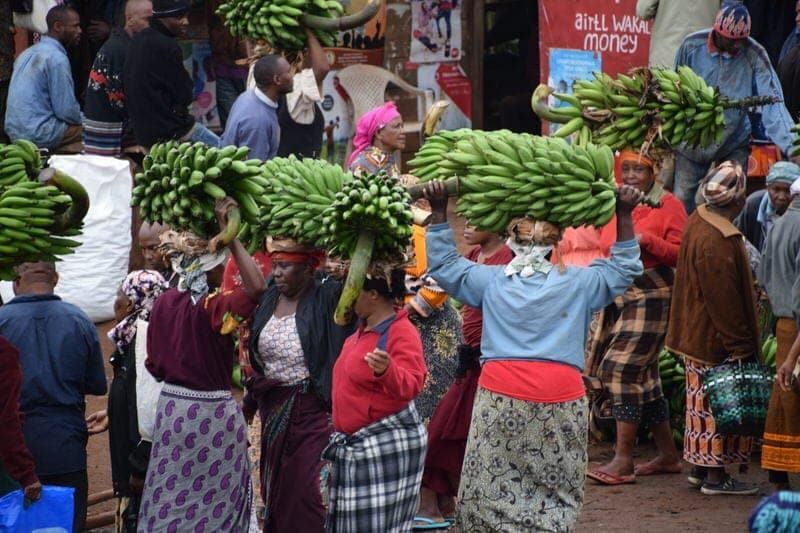 These included the very popular “Jambo Bwana” and a few other songs that are popular on the mountain. While it was impossible to really get to know all the porters and some spoke limited English, we got to know some of them. A few of the porters we also found out were volunteering to do extra duties as they wanted to become guides in the future and we certainly hope that they do! For instance, Zephania volunteered to carry the oxygen tank for us on Summit Day, Yusuph assisted Jamal in bringing us our food and hot water each day, and other porters allowed us to borrow some items we needed throughout the hike. The work of a porter is very hard but we never heard anyone complain, and we very much appreciated the wonderful teamwork. As noted earlier, we were surprised at the actual number of porters but the number was deemed necessary by Godwin to ensure that the porters did not have to carry too much weight as in addition to all the normal camping and food items, we also had the oxygen tank and portable toilet, and water had to be transported to School Hut later in the route. It was important to us that our porters were given a fair amount of weight as we passed many porters from other crews who appeared to be struggling under too much weight. While it is of course impossible to know how forthright crew members might be about your chosen trekking company, several of our crew told us that they really enjoy working for Amani Afrika as they felt the salary was very good, that the safety of the climbers and crew is a priority, that an adequate amount of food and tents are provided, and that Godwin is fair and honest in his dealing with crew members. Most guides and porters are freelancers and don’t work for any particular company so most have worked for many different companies and we certainly heard some horror stories. However, it does sound like conditions have improved a lot in recent times with more strict regulations and the formation of associations for both guides and porters. We could not have completed the climb without our crew and we were lucky to have a crew that not only performed their duties, but who were also knowledgeable, organized, caring, and friendly! Zephania, Salim, and Ethan at the top! We were very surprised by the food. I think we imagined that we’d mainly be eating dehydrated and canned food which is common fare in the U.S. when hiking and camping. Instead most of the food prepared by our wonderful hiphop cook Jamal was fresh, tasty, and filling. 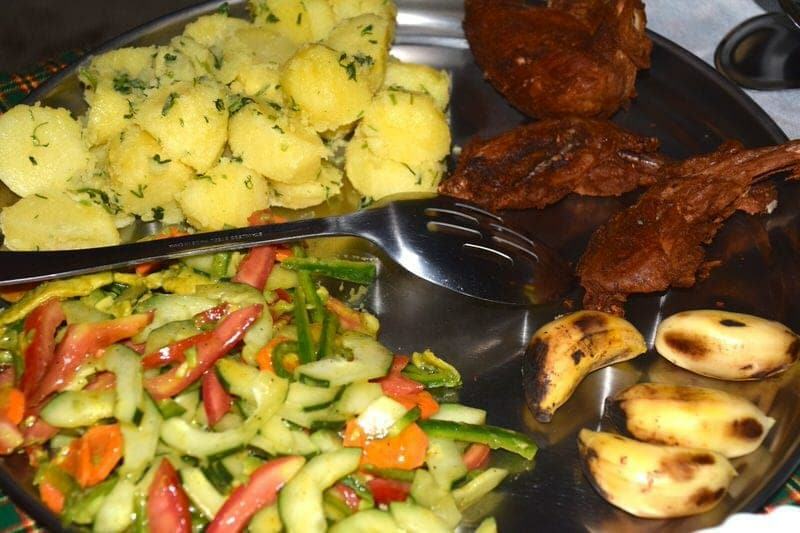 Amani Afrika sources fresh quality food products including fresh produce, cage-free eggs, locally-harvest honey, and homemade bread and cookies. 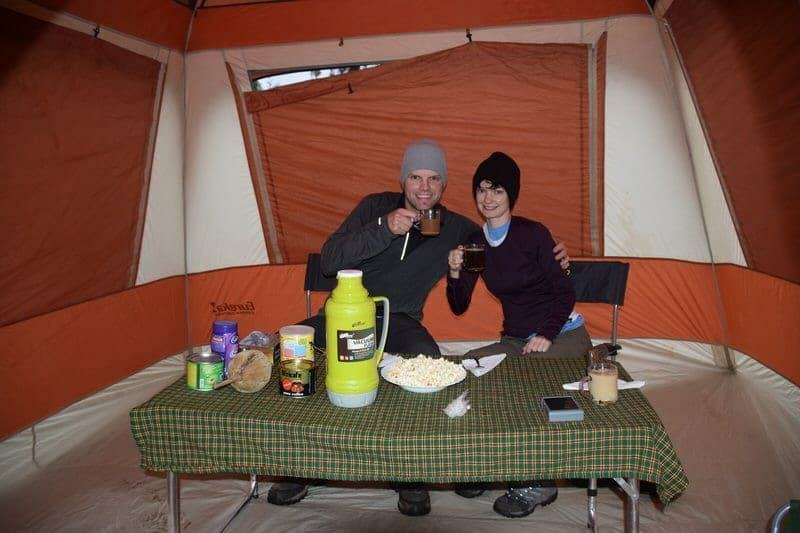 We were served three hot meals a day (breakfast prior to hiking, lunch when returning from our morning hike, and then dinner around 6:30 each evening) plus an afternoon snack (such as nuts or popcorn) with choice of coffee, tea, or cocoa. All meals and snacks were served in the mess tent and this is where the coffee, tea, cocoa and condiments were kept. All utensils and cookware were provided. Breakfast normally consisted of porridge (we enjoyed adding a bit of jam to it each morning), followed by eggs, pancakes (more like thick crepes for Americans), meat, tomatoes, and fruit. Both lunches and dinners usually consisted of a soup dish, followed by a meat or pasta, rice, vegetables, white bread, and fruit. Afternoon snacks were mixed nuts, biscuits, or popcorn. At all meals, there was instant coffee, cocoa powder, and tea bags available that you could use to make hot drinks with the provided thermos of hot water. At no point did we not have enough to eat and in fact there was almost always some extra. At most meals either Salim or Anwary would join us in the mess tent so the food was typically cooked for three to four people instead of two and we were always served first to make sure we got to eat as much as we wanted. During dinner we’d often discussed the plan for the next day with our guides before heading off to our tent to get ready for bed. After we were finished eating dinner, the crew would have dinner which normally consisted of a ugali (cornmeal) or rice dish. Our guide Anwary loved ugali and even though he’d often eat dinner with us, he’d later go have ugali with the rest of the crew which became a bit of a joke in the camp about the large amount that both he and Ethan ate at each meal. Example Breakfast: Porridge, eggs, tomatoes, sausage, crepe pancakes, toast, and fruit. Example Lunch: Green banana, beef, and veggie soup, vegetable curry, rice and peas, white bread, and fruit. Example Dinner: Cream of cucumber soup, salad, fried chicken, vegetables, white bread, and fruit. 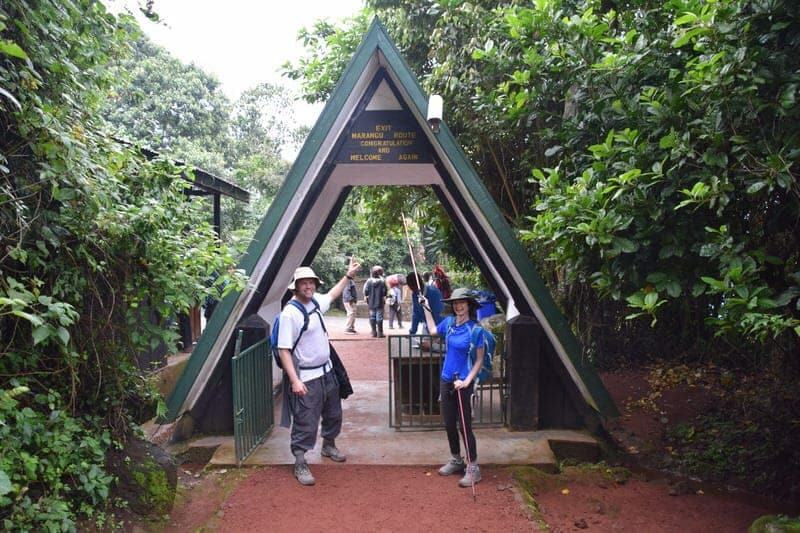 There are only huts on the Marangu route of Kilimanjaro so all other routes, including those taking the Rongai Route, must camp. The camping is basic but Amani Afrika provided all the essentials except for sleeping bags which you can bring yourself or rent on arrival. Our tent was a roomy Eureka K-2 XT tent that provided good protection from the wind and elements and our tent was always set up and well-secured prior to our arrival at the camp each day. 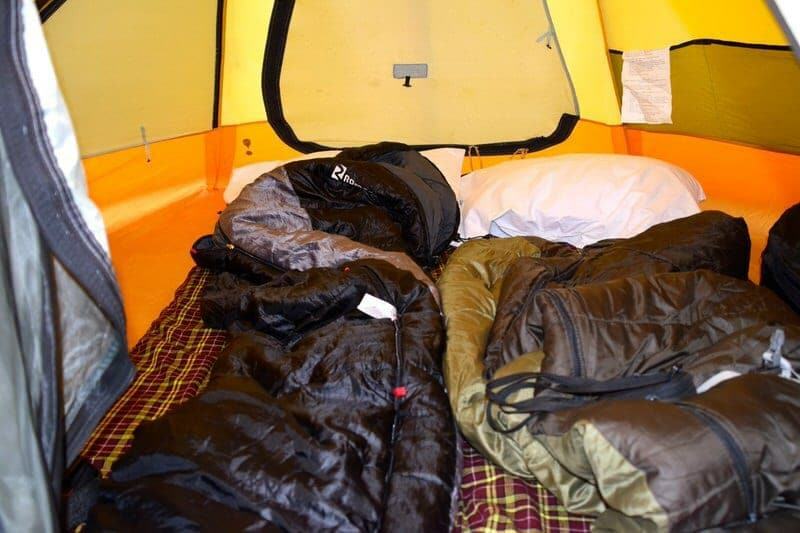 Padding was put down on the bottom of the tent underneath our sleeping bags which provided some extra softness. We were also provided little pillows which were nice and even the pillow cases were changed every couple of days during our trip. We had arranged with Amani Afrika to rent the sleeping bags and liners instead of bringing these with us and these were of good quality and in good condition. There is no heat in any of the tents and at the last couple of campsites it was quite cold so we started wearing our thermals, warm clothes, and hats to sleep with which kept us warm enough to sleep comfortably. We had brought a little flashlight/lantern thing that we hung from the top of our tent in the evening and early mornings to help us get dressed, find things, and read. In addition to the tent we slept in, there was also a mess tent, a cooking/kitchen tent, four shared tents for the crew, and a little tent covering our toilet. The mess tent was where all our meals and snacks were served and was only used for this purpose. It was a large tent with table and chairs, and this tent also served as a place for us to leave some of our hiking things (poles, dirty shoes, etc.) if we didn’t want to keep them in our own tent. 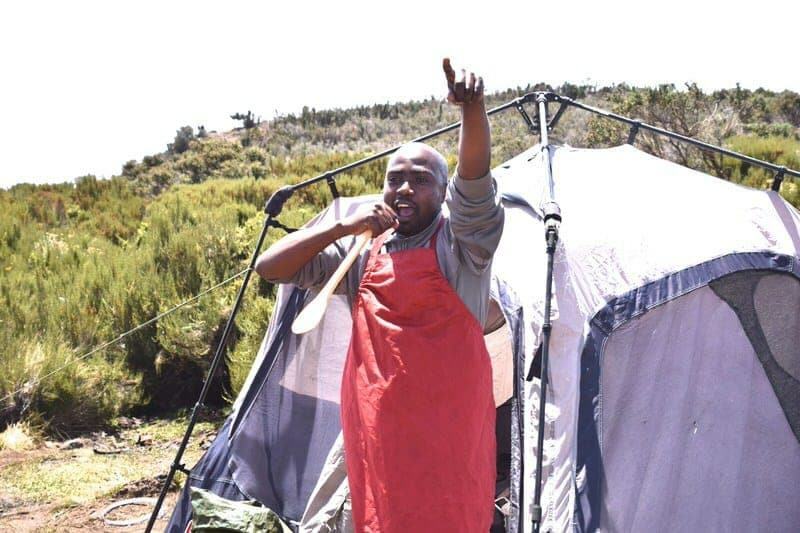 Amani Afrika does not use kerosene for cooking or lighting on the mountain and uses propane and Waka Waka solar lights instead to reduce the amount of non-reusable, non-biodegradable waste on Kilimanjaro. There was a solar light that can be placed at the top of the mess tent to provide light in the evenings. Not all companies provide a portable toilet, and while it is almost always an optional expense, we were very happy to have it with us. 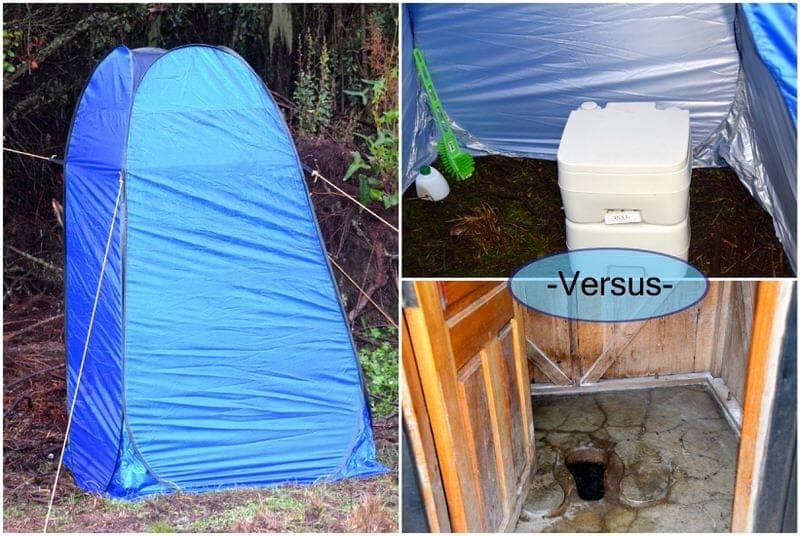 All campsites we visited had a couple of the non-flushing rustic toilets that are shared among the hikers, but having the little portable toilet was very nice. It was just more comfortable and clean to use this toilet and it was more convenient as it was located near our tent and only used by the two of us. The portable toilet has a bottom hole that opens when you pull on a lever and you can push on a button that pumps water through it, so that waste goes to the bottom portion of the toilet. While it doesn’t work as well as a flush toilet, it was certainly worth the extra expense for us as neither of us liked to use the more rustic toilets which were sometimes quite dirty. Toilet paper was provided and the toilet was cleaned and emptied each day. A few of the other things that were notable was the provided hot water, emergency evacuation insurance, and the oxygen tanks. Each morning upon waking, after each morning hike, and before bed we were provided with two plastic tubs filled with hot water and a bar of soap for washing. This water was good to wash our hands, feet, and faces. and we also used these at least once to soak our feet. 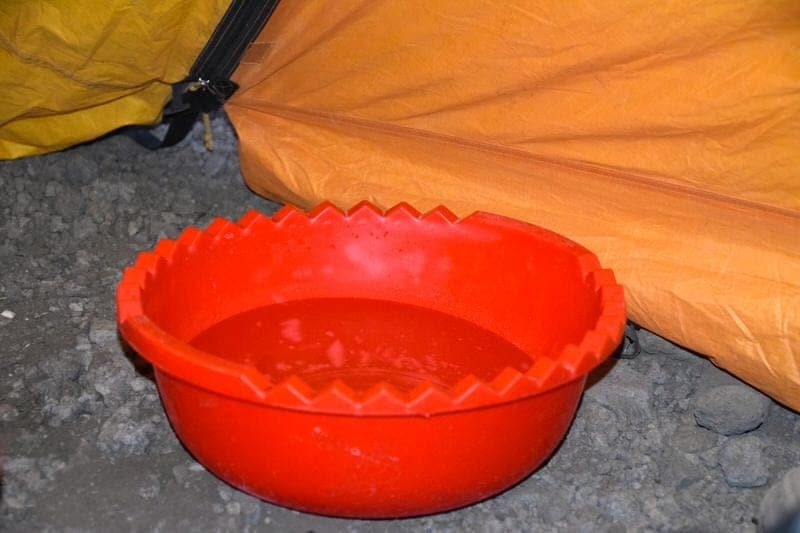 However, it is very difficult to really wash your whole body with this water as you can’t really stand up fully in the tents and you have to watch that you don’t get your camping bags and belongings wet. But we had brought along these large bathing wipes used in hospitals for patients who can’t take showers and used these to clean our bodies every couple of days. 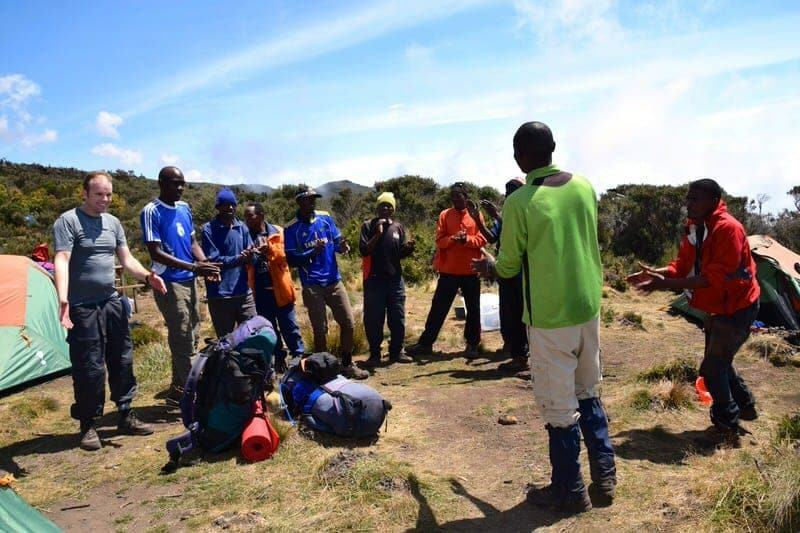 Amani Afrika also provides oxygen tanks to each climbing group and while not normally necessary, it can help those who are struggling with altitude sickness on summit day and can be really useful in more emergent situations where someone is not getting enough oxygen. This oxygen was taken by one of our porters on summit day, and while we never needed it, we were very happy to know it was with us. Similarly, it made us feel better knowing that we had the emergency rescue and evacuation insurance provided through AMREF Flying Doctors that was included with our climb. However, you’ll also want to have your own travel medical insurance as that insurance doesn’t cover any needed medical treatment. We purchased health insurance for our entire trip to Kenya and Tanzania through HCC Medical Insurance Services (one of their Atlas International plans) and we chose them because they are one of only a few companies that will cover medical issues related to climbing Mt. Kilimanjaro and it was inexpensive ($30/person). However, since we luckily did not need to use services through either of these companies, we can’t comment on the responsiveness or quality of services. Our climb of Mt. Kilimanjaro was really a once in a lifetime experience for us, and one that we’ll always remember and be able to share in the memories of having done it together. 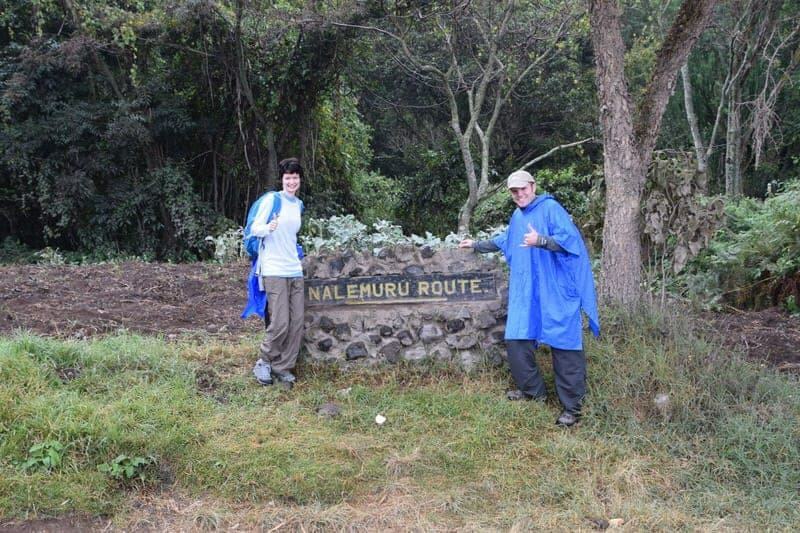 We hope you enjoyed our description of our Mount Kilimanjaro climb along the Rongai Route! As always, we’d love to hear any comments you have for us. If you are considering or planning your own Kilimanjaro trek, please feel free to get in touch and ask us any questions as we’re happy to answer questions and share more about our experience. What a great post with so much detail! I did the Rongai route too only a few weeks ago and this brought back so many memories! 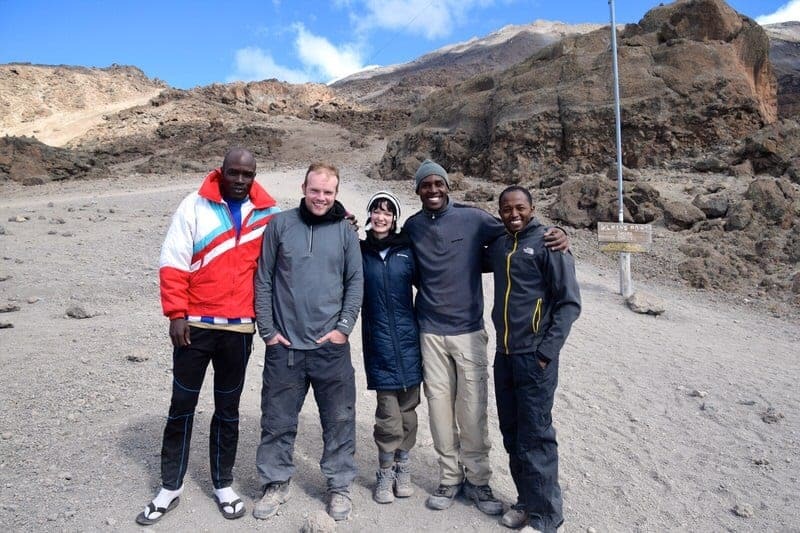 We climbed Kili in rainy season so LOTS of snow!! 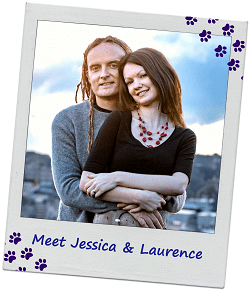 Wow an amazing couples travel blog and such a wonderful story you have! I am thinking of doing a Mount Kilimanjaro climb and the amount of detail here is amazing. Thanks so much and I will check out Amani Afrika as they sound like a great company. Are they able to provide help with flights and accommodation if we flew into Nairobi? Thanks for your help! 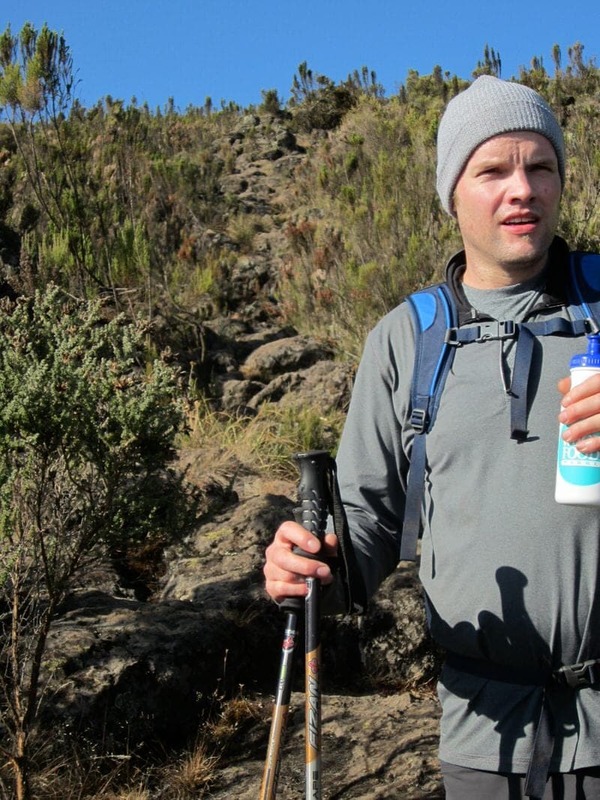 Great to read about another trail and your story of Kili! Jessica did you take altitude medicine? All in our group did and that seemed to help most of us. I still had a headache but it is was not too bad. Also felt ill summit night but also manageable. 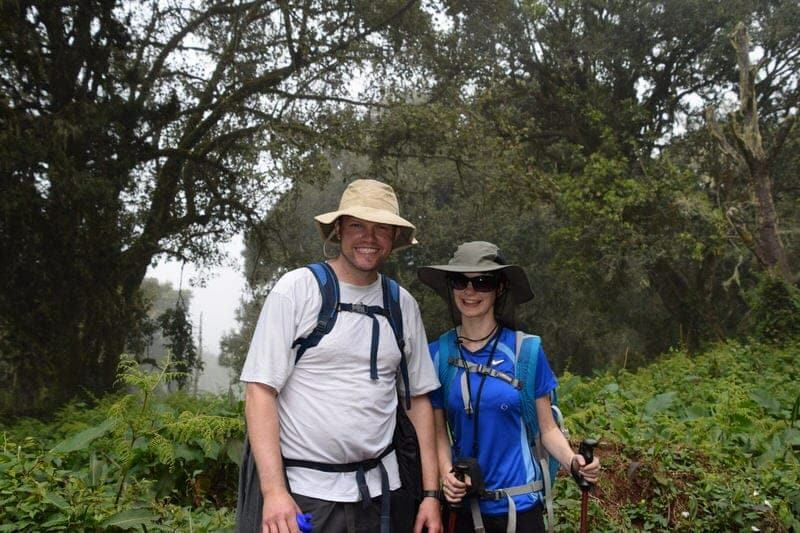 Great seeing your photos and the beauty of Kilimanjaro! Roars to both of you! Thank you so much for the detailed blog of your climb. It was so good hearing how each day went for you and congratulations to both of you for climbing Mount Kilimanjoro. How much training did you do before you went and did you book direct with Amani Afrika. How much did you give the porters for their tips. Thanks once again, I can’t wait to do it. Planning to do it in February 2016. I am glad that you found our blog post helpful in planning your Mt. Kilimanjaro climb. We trained for about 2-3 months before the climb and mainly did hiking, with a gradual increase in the length and steepness of the hikes. We would hike about 3 times a week when possible in the 2 months before the climb and Ethan also did some regular biking. We did book directly with Amani Afrika and we both fully recommend the company (you can find their email and phone numbers on the website). For tipping, I would have to consult my notes for exact amounts but I think we gave $30 to each of the porters (with one receiving $35 for extra work), $55 for the cook, $65 for our secondary guide, and $75 for our main guide. We actually did not come prepared with enough cash as we thought we’d have fewer porters and only one guide. General recommendations are to pay a bit more than we did (we were not sure in advance about the proper amounts and should have asked) although we do know that our team was well paid by Amani Afrika compared to the typical climbing team which depends much more on tips to supplement low wages. Here is an article that might be useful for deciding on fair tipping amounts: http://www.climbkilimanjaroguide.com/tipping-on-kilimanjaro/ and I would also suggest asking your climbing company for their recommendations. Ask companies you are considering about porter and guide wages as well and try to book with a company that pays fair wages. Good luck Karen and please do get in touch again if I can be of any further help! Great post! 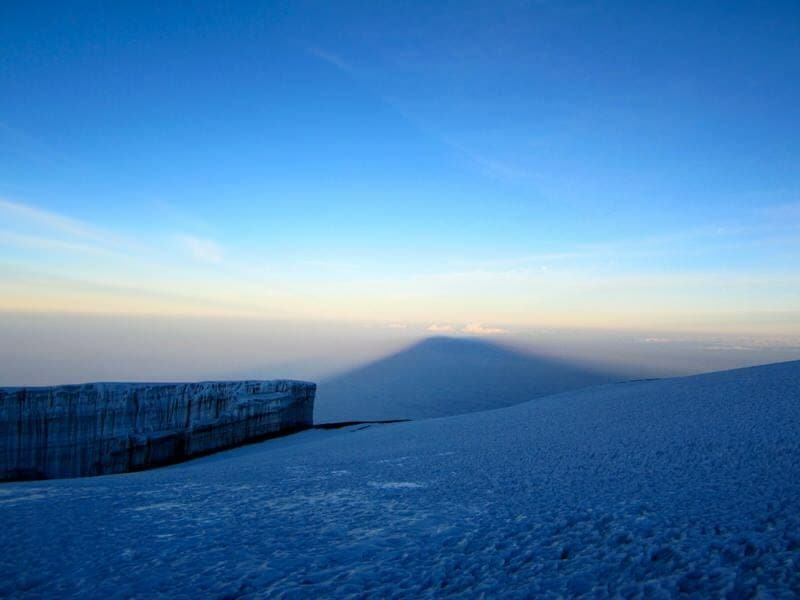 I’m hoping to ascend Kili within the next year, so this was a very interesting read for me. Did you guys try the ugali? I had it the last time I was in Kenya and really enjoyed it. Hi Dave, thanks for stopping by! 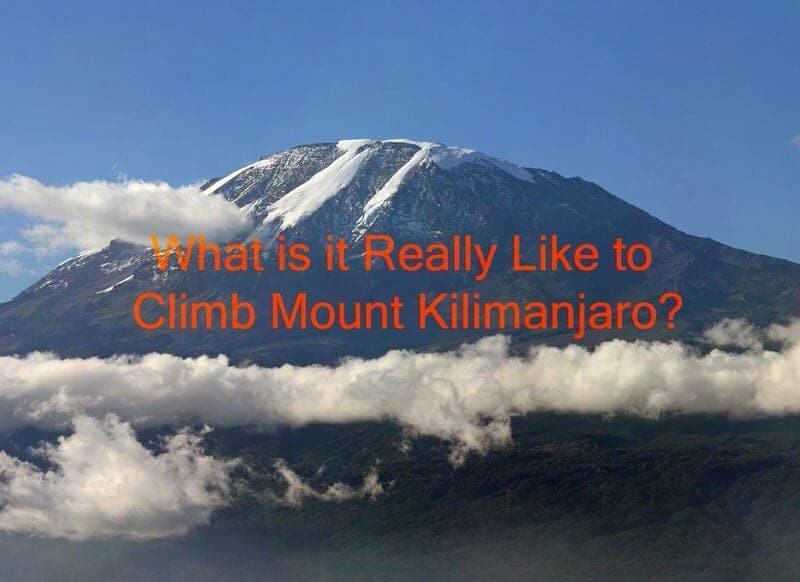 Just let us know if you have any Kili questions once you get closer to your climb and we’ll be putting up more posts on the more logistic issues over the next couple of months. We didn’t eat ugali during the climb as the cooks prepared us so much other good food, but we did eat it a few other times during our trip. We found it bland by itself, but that it can be very yummy if mixed with a good sauce, veggies, or meat. This seemed to be the favorite staple food of just about every local person we talked to in both Kenya and Tanzania! 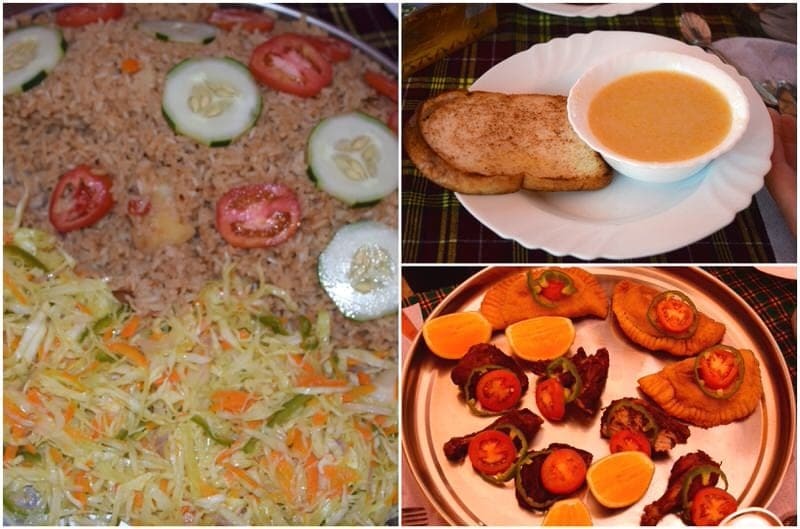 A definite must-try if you want to sample local East African food. 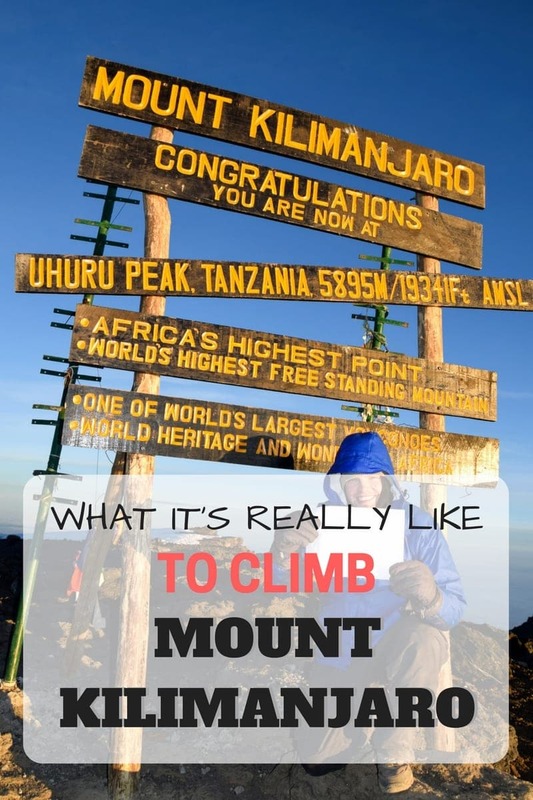 I wish I had come across such a comprehensive blog about someone’s climb before I hiked Kilimanjaro! A beautifully and honestly written account with great detail. Thanks for sharing! Hey Amanda and fellow Kili climber (she summited the same day as Ethan)! It has been surprising to us how few really in-depth blog descriptions are online about Mt. Kilimanjaro so we are happy to offer one as I think we went into the trek not really knowing what to expect as far as the daily routine, food, scenery, etc. In some ways that was nice to be surprised, but it might of helped us prepare a bit more (literally and mentally) if we’d seen a post like this before we left. Thanks Nancy, I am just so glad the headaches finally stopped before we got to the finish gate:) Even smaller mountains are still pretty impressive, we always feel so good when we conquer our local little mountain here in the Bay area called Mission Peak! Congratulations to both of you! That climb is a major achievement and definitely inspirational! 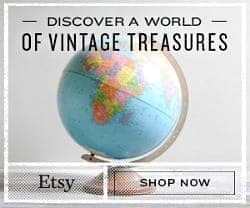 I appreciate the detailed description and the honesty – it’s important for people to know the ups and the downs, especially with endeavors like this. I had never thought about the amount of true effort it takes to embark on this kind of adventure – it sounds like the crew was wonderful.! Yes, our crew was amazing and we simply and honestly could not have done it without such a great crew! I didn’t make it to the summit but probably would not have even tried to summit that evening if I didn’t feel completely safe with the crew and Ethan was ready to turn back at least one during his summit experience. 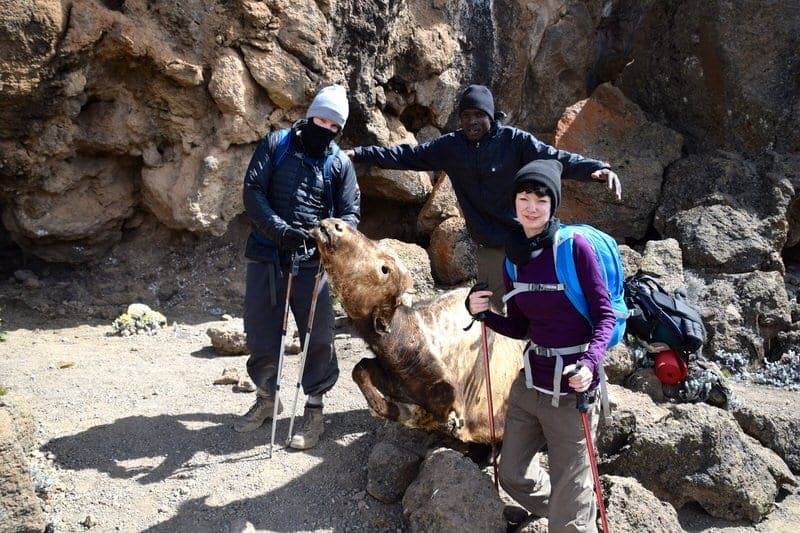 It can be really physically and emotionally challenging for many trekkers so a competent and caring crew like the one we had with Amani Afrika is really essential. The trek is clearly not for everyone and we definitely had some bad experiences (mainly me) but I still would have done it again in retrospect. This is one awesome post. So much info, anyone who wants to do this (not me, I am far too lazy) will have everything they need to know. Thanks SJ, we hope to post some more related Kili posts to better help people choose trekking companies, understand the costs, and pack well for the climb. We’d like to help share what we learned from our discussions with local guides and operators & our own time on the mountain as this hike is such a big investment of time, money, and emotions for most trekkers. Wow this was inspirational! I had never read about an in-depth description of hiking such a high mountain and it’s really interesting to hear about the good things and the low points of the climb! It seems so challenging with the headaches and nausea. Congrats to both of you, it is really an incredible achievement (and for charity on top of it!)! Brilliant! Wow, what an amazing experience. This is a fantastic post, I love the amount of time you have invested in showing just what this was like. Congratulations to both of you for your incredible efforts! what an experience! i can say I’ve never really experienced anything like that. It looks amazing! Thanks Amy for stopping by and I am sure you have some equally amazing travel experiences coming up in your future! What an awesome opportunity and an even more awesome accomplishment. 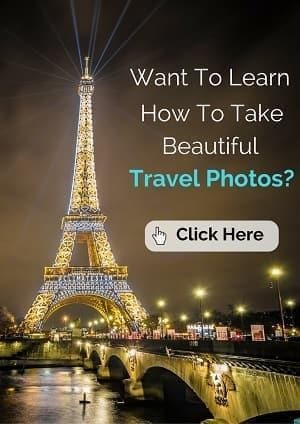 I am sure this informative post will help many others hoping to achieve this feat. It certainly looked like a life altering experience. Thanks Holly, and yes it was really an amazing experience! Wow, what a great and informative article! Loved it! And amazing photos! We really want to do this climb too, so this is perfect reading for us. We do a lot of hiking and climbing back home in Norway, but have never been this high. Hmm, I am a bit worried about altitude sickness. Good to know that you will be taken good care of if it happends though. How much did this trip cost, approximately? Can’t believe you had that much crew only working for the two of you! 🙂 So they don’t take larger groups or? Wow! Impressive. I would have not made it as far as you, Jessica. I think seeing my name crossed out would have been hard after all that work. Sorry you got sick. Altitude will do that to you, and it affects everyone differently. I’m not a fan myself. Love the detailed description of the entire experience. I think you may have made it further than you think:) But I think it is so hard to predict although most people are able to summit. Sometimes people with almost no hiking experience make it further than athletes, as so much can depend on health and how one responds to the altitude. What an adventure! 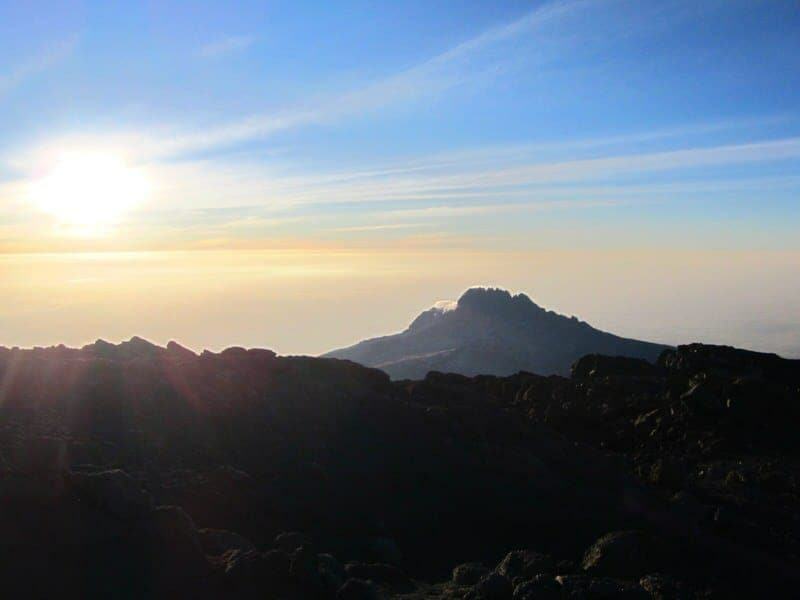 Kili is on my bucket list too; I recently got into long distance hiking but I have never been in over 2500m so I definitely want to try a ‘regular’ trek in altitude first before attempting Kili… 🙂 And a nice blog you guys have! I will go follow you on Instagram and FB now too! 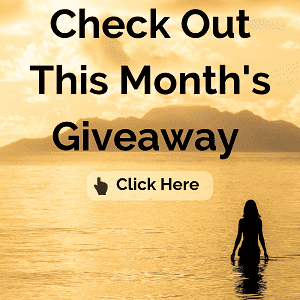 🙂 I would like to invite you to take a look at my new blog (1 month old) too! Safe travels! Welcome Annika, we are happy to have you as a new reader! 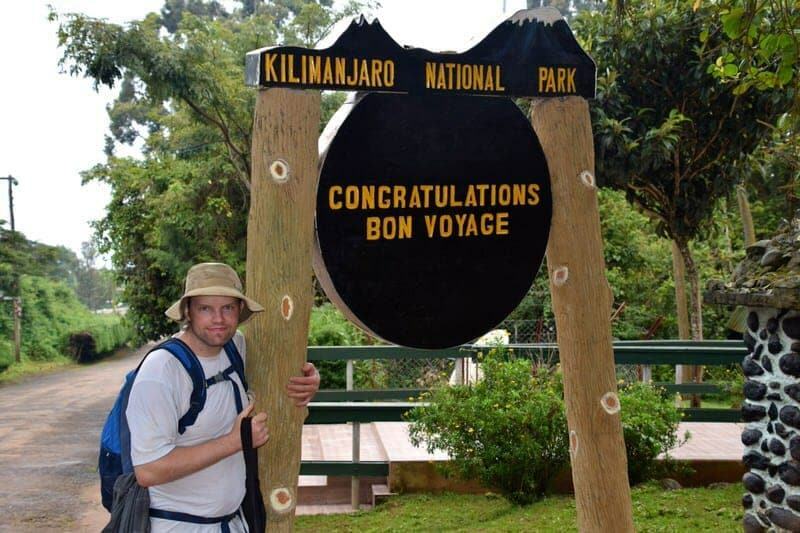 Yes, our Kili climb was certainly an adventure and I hope you get there some day. I will check our your new blog.